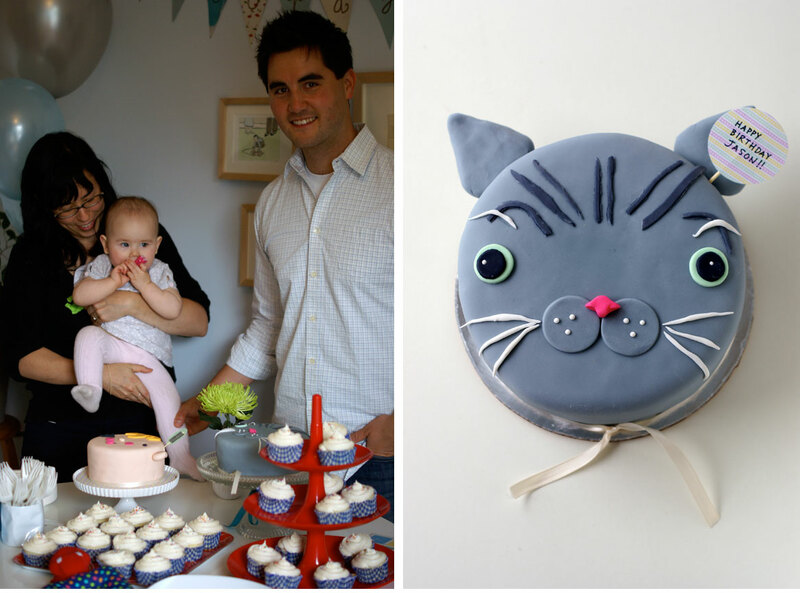 Tomo the cat cake and Funny Face cake! Funny little wooden dude – one of Saya’s favourite things! Cake version of Tomo the cat!!! Oh, how I was chuckling away when making his crazed face. Me trying to pet the real Tomo but him getting super mad at me! Still so cute!!! Oh well, I can always pet the cake version. Cupcakes. Love the contrast of the bright red stand with the gingham blue liners… ! Lookit that face! HBD Saya! Super cuted out cakes for super cute kid’s parties? LOVE making cakes for them. Love it. Animal face cakes, especially. I’m thinking of only doing those for the rest of my cake-ing days. It was my dear friend Miko’s daughter Saya’s first birthday party a few weeks ago… Saya’s gotta be one of the cutest and funniest little babies I know. Her expressions are beyond bonkers… going from giggle-zone to stern frown in lightning speed… and whipping quickly to boogying chuckles back again! Saya’s birthday happens to be the day after her dad Jason’s birthday… pretty cute slightly belated birthday present for Jason one year ago, don’t you think? A super cute baby? Yeah, pretty good present…! Saya’s cake was vanilla with vanilla buttercream, and Jason’s cat cake was vanilla cake with strawberry jam filling and vanilla creamcheese frosting, and the cupcakes were the same flavour! 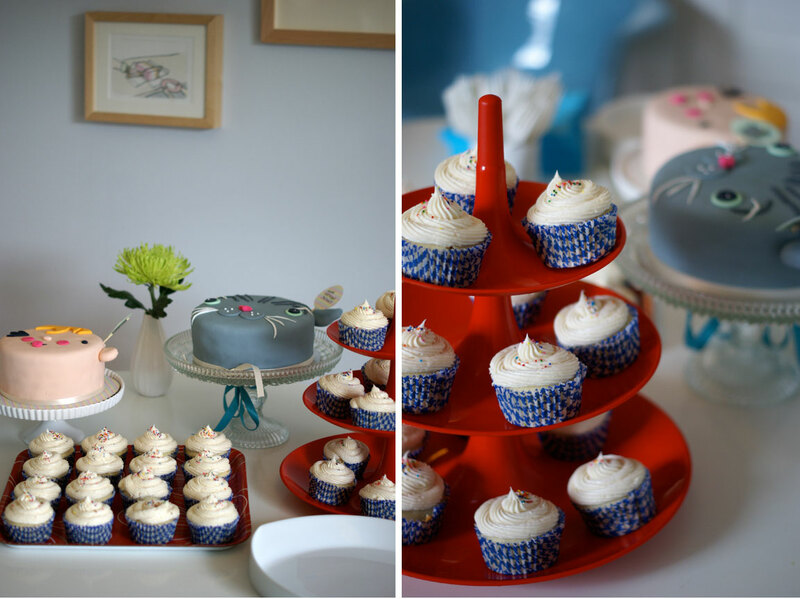 I am LOVING those gingham bright blue cupcake liners! Thanks Miko for the super fun order… and happy birthday to dear Saya! The Very Hungry Caterpillar Cake – Still Hungry… After All… These Years! Leapfrog My Pal Scout Cake For Baby Norman! How cute! Next year I’m turning 30 and my daughter 1, so I might do something like that! I’m absolutely loving these cakes! the cat is my favorite, so good. Oh that is a cute baby and equally cute cakes! Love it. Thanks Nina!! ^__^ Yes, you should totally do a double birthday party! So fun! Thank you Dia! I also love the cat! Thank you Alanna – yes, crazy cute baby eh! It all looked so great. All that effort was definitely worth it. These are possibly the cutest cakes I have EVER seen.I am head over heels in love.